TAMPA, FLORIDA – Google is constantly launching search ranking updates to separate the wheat from the chaff. Google wants to give users high quality results and leave low quality results miles down the results page. As a result, webmasters face bigger challenges as SEO evolves. The last few Panda and search algorithmic updates pulled down many sites while others climbed up the organic ranking ladder in SERPs. 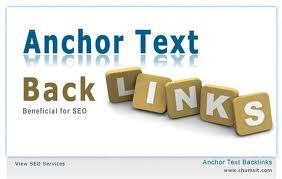 When I stepped into the field of SEO, I understood the role that anchor text played in ranking a site. The times are changing at a tremendous speed, forcing every good SEO pro to use only the most ethical SEO techniques. We all know that links pointing to your site are good for Google rankings. We’ve talked before about the dangers of black-hat link building and why you should avoid it. Let’s examine the anchor text links, which makes a difference in how Google uses your link information. First, what is anchor text? Anchor text is the actual phrase or word that links to a URL. In the above paragraph, “black-hat link building” is an anchor text. Most sites have easily recognizable anchor text, as it’s normally blue and underlined. You can use anchor text either internally (on your own site) or externally (from other sites). Usually, anchor text includes keywords relevant to the page they’re linking to. If you want to rank a page for certain keywords, try to create as many anchor text links as possible with those keywords. This will help improve your site’s rankings for the targeted keywords. Anchor text remains one of the SEO practices you can use to climb to the top of Google. Anchor text linking has always been a critical part of any SEO campaign, but there are some practices to avoid. Google now penalizes sites that indulge in excessive use of exact-match anchor text for ranking at the top of search results. If your anchor text linking looks unnatural to search engines, you can lose your site’s rankings just as quickly. 1. Millionairium provides free SEO tips. 2. Click here for free SEO tips from Millionairium. In the first example, the anchor text includes a keyword that potential clients could be using as a search query. In the second example, “click here” is the anchor text. Clearly this isn’t informative for Google. The first example uses a keyword and lets Google know more about the linked-to site. Shoot for the first example when link-building organically. Another important point is the placement of the link on the page. Let’s look at the example above one more time. Both hyperlinks point to https://www.millionairium.com/, but if multiple links on one page point to the same location, Google will only credit the first link. Therefore, the “free SEO tips” anchor text will be counted, but the “click here” is irrelevant. SEOmoz CEO Rand Fishkin gives a quick but comprehensive anchor text lesson in an edition of Whiteboard Friday. The biggest challenge is that in most instances, we can’t control inbound anchor text. “If you’re earning links and you can’t control the anchor text, maybe at least you can get them to mention what you do somewhere near the link,” Fishkin says. As Fishkin says in the video, links that point to your site from your site help a tiny bit, but links pointing to your site from an outside source help a lot. Think of ways you can control the anchor text pointing to your site. Guest blogging on another website is an organic way to make this happen. Use relevant keywords in your anchor text whenever you have the opportunity. Remember that Google focuses on the user’s experience. The best practice is to make the anchored links relevant to your user. Google punishes bad practices, but good, relevant links and descriptive anchor text will be rewarded. How about when posting comments on other blogs? For example, the name field on most blogs will be the anchor text for the link, correct? Is it still worth it getting a link with your name as your anchor text? It is good to have more and more Anchor Text links from relevant web community but the problem is that there is a situation when you have the same for too many that will getting in trouble from penguin by saying that \”Penguin Hates The Exact Match\”. A very nice tutorial on Anchor text. I have never read such a detailed article on “Anchor Text”. Using the URL as the anchored text will improve your site\’s popularity, but doesn\’t necessarily improve its rank for any particular keyword besides the URL. Good question. Good question. There is no limit, but the importance is to \”continue\” the same efforts over time. If a site gets 1,000 links in one month and the next month it gets 10, Google becomes suspicious. Makes sense? Its very informative post I like it,thank you TAMPA, FLORIDA. so It\’s absolutely genius to take your time making appropriate anchor texts. How does it influence on your position in search results when you use the desired URL as your anchor text? A very nice tutorial on Anchor text. I have never read such a detailed article on \”Anchor Text\”. Very interesting and informative article specially for CLA department, but there is a question, Is there any quantity limitation for links that one site gets per month? I wonder if those black-hat techniques would still work for Google, we wouldn\’t be able to find any useful material on the net. Now that Google ignores repeated anchor links and counts only the first one, nobody wastes his time with making hundreds of links in one webpage.